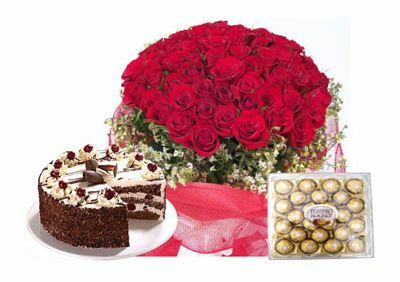 This combo consists of 40 red roses bouquet,1kg delicious cake and ferrero rocher chocolates 24 pieces.Someone Special is our exclusive gift hamper for the most important person in your life.This wonderful gift hamper includes a bouquet of radiant red roses, a rich one kg cake and a pack of 24 pieces of Ferrero Rocher Chocolates. The artistic arrangement of 40 blooming red roses along with green and fillers done by our florist is simply awesome.You can choose the flavor of the delicious cake you have the choice of Butterscotch,Strawberry, Vanilla, Pineapple and Chocolate. The Someone Special package alsoincludes the mouth watering Ferrero Rocher chocolates. 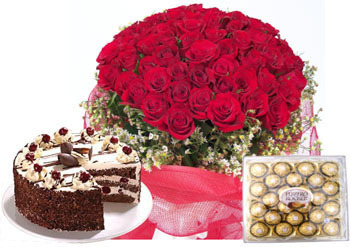 Send roses bouquet online along with the cake and chocolates to make someone feel special. This combo is ideal for birthdays, anniversary and Valentine’s Day. For “Egg less cake” choices please specify a noted in “Special Instructions” message box during the checkout.